Two weeks from today, my girlfriend Danielle and I will be preparing to board our red eye flight from Miami, Florida to Madrid, Spain for the start of what could potentially be a 3 1/2 to 4 month trip. The initial plan right now is to spend the first month in Spain and Portugal before heading north (more on this later in the post) for the remainder of the trip. So, with two weeks left before our departure I thought I’d lay out a potential itinerary. I did the same thing before my last trip and I ended up visiting quite a few of the places I had planned, and it was a cool post to look back on throughout and after the trip. With that in mind, I hope this post generates the same response with suggestions of things to see and places to go, and if you see something you think is overrated I’d love to hear your opinion about it. Hearing from people who have already been there is by far my favorite way to plan my travels, and although this will probably only serve as a rough guide as we will almost certainly cut and add different stops along the way, I feel this is a good start. -We’ll fly into Madrid(A) where we’ll spend a few days getting acquainted with both a new country and a new time zone. I’ve had lots of suggestions on things to see here (like day trips to Toledo, Avila, or Segovia) and if we end up loving the city, we’ll stick around for awhile. To be honest though, the things I keep hearing about Barcelona(B), our second stop, sounds like a city we might fall in love with. -So yea, jumped ahead there, but after Madrid(A) we’ll take a bus or train to the Barcelona(B) area for what I’m anticipating will be our longest stop of this leg of the trip. With all of the incredible architecture and the beach right there, man… if this turns out how I think it will be, maybe we’ll just stay here! 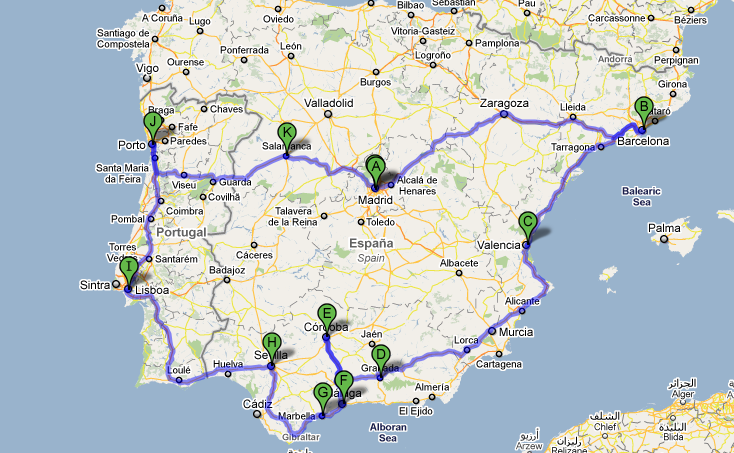 -After Barcelona(B) we’ll head down the coast to Valencia(C). Don’t know much about this city, but I’ve heard we should stop there. Assuming we aren’t way behind on time already (I HAVE to get to Portugal at some point) we’ll check it out. -After Valencia we’ve got some decisions to make. I’ve heard great things about Granada(D), Cordoba (E), and Malaga(F). Where exactly we go and how long we stay will depend on how long we’ve spent in our first few stops. -Even though Marbella(G) is not normally a “backpacker” stop and is more of a resort area, we’ll be stopping here to meet some people who work for a new company I’ve gotten involved with. There will hopefully be a few “work days” for me here but we’ll try to take in some of the sights without spending a million doll… sorry, a million euros. -After Marbella we’ll head towards Portugal with a stop in Sevilla(H). I’ve heard so many great things about Sevilla that we might have to make this stop a bit longer than some of the others. -Our first planned stop in Portugal is Lisboa(I) or, Lisbon, as the English speaking world knows it. There are quite a few places we can day trip to from here, but I’m really looking forward to experiencing, what I’ve heard, is an awesome nightlife. -After Lisboa(I) we’ll head towards Porto(J) where we will enjoy some port! Now, I’ve only placed two different stops in Portugal, but the reality is everything is so damn close together, we will be able to EASILY go to lots of different places from these two “hub” cities. We’ll see how much time we’ve got. -After our time in Portugal we’ll head back to Madrid (I’ll explain why below). If we’ve got time we’ll stop in Salamanca(K) which has been described to me as a cool college town, aka, a good time! -Then, back to Madrid for whatever time we’ve got left. So, the reason we are heading back to Madrid is because of the next step in our plan. First a little background. If you’ve read my “About” section then you know one of my jobs is teaching an LSAT (test to get into law school) prep class. I’ve currently been offered the opportunity to teach a class that is held in London starting in mid July. Right now our plan is to fly from Madrid to London where we will rent a place for 2 1/2 months while I teach this class. The class will only be held two days a week, so we will use my off time to jet set around Wester Europe via the super cheap and somewhat crappy (so I’ve been told) airline of Ryan Air. It is not 100% certain that this class in London will happen, but I’d like it to so I’ll be optimistic. If it does this will put us in London until the very last days of September. If this class does not run, then we’ll be backpacking north through the basque country of Spain and France towards Belgium, and eventually the UK. So, obviously, this part of the trip is all up in the air and we’ll see what happens. So there you have it. Our plan. It will probably change 100 times before our month in Spain and Portugal is complete, which is exactly what I want! That, my friends, is the beauty of travel. This sounds like an awesome trip! Reminds me of my 3 weeks I spent in Spain and Portugal. There is so much to see in Spain – I didn’t even get to Valencia, Bilboa, or many other places. After visiting Portugal, I wish I had more time to spend there. If you can squeeze it in, the Algarve coast in Portugal is beautiful and less crowded than the Costa del Sol. Very curious what you think of Madrid as well. Very envious of your time over there. Sounds like a great gig teaching two days a week and then free to travel. If you want, check out my site as I did a 12 part series on my trip through Spain and Portugal detailing everything I did as well as my thoughts on each place. Have an awesome trip! Hey Jeremy, yea I’ve looked at some of your trip posts and I plan to look at some more! We’ll have to see if there is time for the Algarve but I have heard from numerous people how nice it is! Thanks again for all your advice! Unfortunately, I haven’t been to Spain or Portugal yet. What I know of the area, you are hitting some great locations. Looking forward to reading about your trip as it is unfolding! Thanks, glad to hear it! I’ll be posting more the as soon as we land! Sounds like a really great itinerary! I’ve been to Spain and Portugal so many times – Barcelona is an amazing city, as is Valencia. If you get a chance and it’s not too much money then you should try and head over to Mallorca – My favourite place in the world! Wow, strong words! If it is your favorite place in the world then we might have to make a stop there. It obviously has to be pretty amazing! I haven’t been to Europe yet but I always thought it would be cool to visit Andorra, the tiny country between Spain and France. No one ever goes there! Wow… I totally forgot about Andorra… If we head north to France I will 100% be stopping in Andorra at least just to say I was there! Looks like a great trip! I have never really done any travel in Europe for a large amount of time, just bits and pieces every now and then, but I would say you are hitting all the best spots! Yea hopefully we have enough time for some real in depth exploration. We’ll see how slow we end up going! Wow Matt! Great itinerary you’ve got planned! Makes me nostalgic for my time in Spain! I agree with the above posters! Maybe I could offer my own suggestions? 1) If you have the time, try to get to San Sebastien. It’s in the Basque area of Spain, not too far from Barcelona, but looking at your route, it’s the opposite way of Valencia. Regrettably, I’ve never been, but all the people I’ve met in Barcelona were raving about San Sebastien. 2) Take the bus to Toledo, skip the train. The bus is cheaper and takes you closer to the city center at Toledo. The hour the train saves you isn’t worth it. Bring snacks as the restaurants are really overpriced! When you get off at the bus station, you’ll see a little red and blue smoke store, buy a map of the city from them. They sell maps for only 2 euro, cheaper then anywhere else I saw. 3) A good way to get introduced to Barcelona is to take the free walking tour from travelbound (http://www.travelbar.com/es/free-walking-tour/index.php). Ask for Mike. He’ll get the whole tour group a round of beers after the tour! Watch out for pickpockets! I can’t stress that enough! 4) In Seville, I recommend the free walking tour (http://www.panchotours.com/pancho_in_sevilla.html). The guild, Dario, is both entertaining, funny and knowledgeable about the city and it’s history. He’s an Italian living in Spain and has been for the past few years. Tell him I say hello! He’ll tell you the best place to go for tapas and to see a flamenco dance. Do not leave Seville until you have witnessed flamenco dancing there! It’s a living art form! I still keep in touch with Dario 2 years after experiencing his tour and I plan on going back to see him again! 5) In Lisbon, try to book a bed/dorm/room at the Travelers House Hostel. It’s rated the best hostel in the world year in and out. I took my chances there and it was literally the very best hostel ever! Jota, Miguel and Guy will bend over backwards to help you get the most out of your stay in Lisbon. They’ll introduce you to the Portuguese culture like no other. I really can’t say enough good things about that hostel. Please, if you have the chance, stay there! Ask Jota where to go to experience “Fado” and the best Bachulau in the city. Be sure to visit Sintra and swim in Cascais too! I still send those guys postcards when I’m traveling, even years later! 6) Also in Lisbon, a good way to see the historical areas easily is to take TRAM 28. Tram 28 will go by all the tourist areas for the cost of a single ticket. Easy, cheap and great to get around Lisbon in! 7) Finally, in Lisbon in the Belam neighborhood, you’ll see a shop that sells the best custard tarts ever! I got 4 of them, then sat by the river and devoured them all. They were so very rich, I ended up really, really sick… So I walked back to the shop and got 12 more! 8) In Porto, take a boat ride on the Douro river. They’re not expensive (10 euro) and they include 2 free port wine samplings at the local wineries. Kill 2 birds with one stone! Try a dish native to the city, called Francesinha. Make sure you drink beer with it, and not wine! Sorry about the long post, but hope all this helps! I like the itinerary but you are missing out Cadiz, which would be easy to visit on your way to Sevilla, as would Jerez. They are both well worth visiting, especially Cadiz, one of the most magically beautiful cities I know. I’ll have to see if I can fit a stop in, thanks for the suggestion! Looks like a fun itinerary to me. I only spent about 5 days in Spain when I went there on a high school trip many years ago. Looks like you’re going to have the time to really explore the country. And believe it or not, I’m sitting here thinking how I don’t have enough time, haha. I’d include the Balearic islands as well – Mallorca is especially lovely, I think. Sounds like you have your hands full with this itinerary. Spain and Portugal is one of the places I would love to visit one day, just waiting for my currency to get stronger verses the Euro. Traveling in Europe is not cheap for Southeast Asians due to the high currency exchange. Sounds like a fantastic trip! I loved Spain and we head to Portugal ourselves for the first 10 days in July – John has been but I haven’t…can’t wait! Maybe our paths will cross =) Have fun! Yea that sounds great! That is when we should be there! Sounds gorgeous and I heartily approve of your style of planning an itinerary but being relaxed and open about what actually happens. And most of all I’m jealous that you’ll get to Portugal, it’s somewhere I’m really keen to see yet despite spending heaps of time in Europe have never got there. One day! Hey there! I’m Alice from Romania! Looking in your travel plan I saw you are going to Lisbon. I must recomand you Sintra (45 min by train from Lisbon) it’s one of the most turistic place of Portugal, you sould see there the Quinta de Regaleira an extrordinary garden and castel, The Pena Castel, The Moorish Castel …. they are all amazing! Than you sould take the bus to Capo Da Raco the most vest point of Europe! It’s interesting and all you can make it in a day trip from Lisbon! Thanks for all of the tips! We are actually in Porto as I type this, so we” have to see what of this we can get to. Thanks!